Soap nuts can be found everywhere today, at specialty stores and your local Walmart among other places. It is one of the cheapest cleansing agents that also happens to be all-natural and all-powerful. Soap nuts are actually berries. Although they are called nuts, these amazing cleansing agents are actually berries of the tree Sapindus Mukorossi that grow in many places around the world where the weather is warm and sunny. India is the largest producer of soap nuts or soapberries followed by Pakistan, Nepal and China. The fruits of the tree contain saponins in a high amount, which are soapy-like compounds, ideal for washing. Soapberries are used primarily as natural laundry detergents but can also be incorporated into body washes, dog shampoos and many other types of products. Soaps nuts are used for various purposes. Because soap nuts are gentle on the clothes and skin, they are ideal for washing baby clothes and cloth diapers. The saponins in soap nuts penetrate the fibers of the clothing, not only removing stains but also loosening the fibers and providing fluffier and smoother clothes. To use as natural laundry detergent, add just a few nuts – about 4 to 6 in a cotton muslin bag and wash preferably at a high temperature. You can use soap nuts several times until they turn mushy and grey and is no more of the foamy, honey-like liquid inside. In Ayurvedic medicine, the fruits of the tree along with the leaves are used to help with various conditions. They are believed to relieve arthritis, constipation and to prevent cavities. 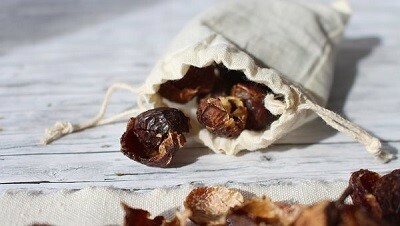 Ayurveda uses soapberry leaves and the fruit extract to soothe acne and eczema. Soap nuts can be used as an alternative to conventional dish soap by boiling them to create a thin liquid. If you want to use soap nuts as dishwashing soap, boil around 12 of them in 2 cups of water for about 10 minutes. Add a few drops of essential oil for a pleasant scent. You can also use soap nuts as 100% natural shampoo. Use about five soap nuts and boil them in a small muslin bag with 2 cups of water. Simmer for about 20 minutes, add a few drops of your preferred essential oil and simmer for another 10 minutes, then squeeze the bag to release the foamy liquid. Store the shampoo in a glass jar in the refrigerator. Another way to use soap nuts is as a natural all-purpose cleaner. You can use the same recipe as for dish soap and replace the tap water with purified or distilled water, only you allow the content to boil for up to two hours. Add white vinegar to the mixture and use as needed. It’s important when you buy soap nuts to choose from trusted brands, as you’re going to want to be buying the best for your purposes. And the best soap nuts are usually wild-harvested in places where the trees grow without chemicals and pesticides.